In RR, an 8-foot segment of a railroad including gravel, railroad ties, and steel rails is set between two vertical panes of two-way mirrored plexiglas. 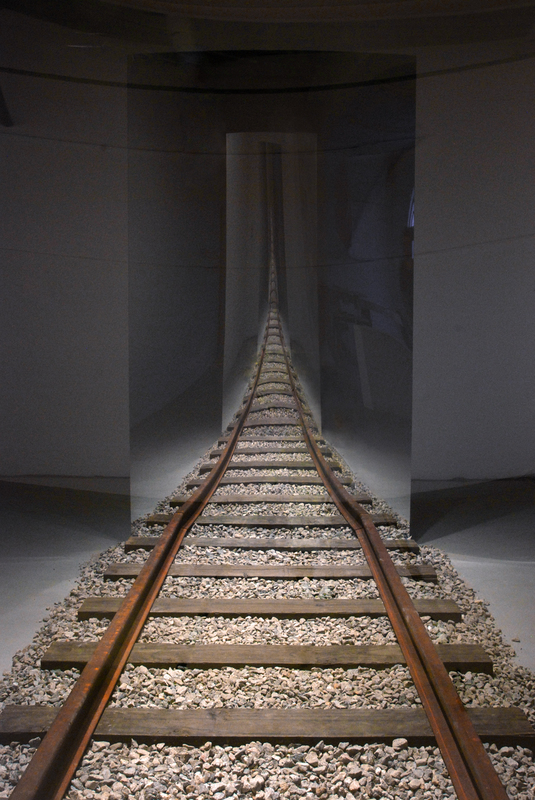 When viewing the artwork from its mirrored ends, the illusion is created of a railroad extending into infinity, yet when walking around its open sides the image collapses back into tactility. The railroad track as a symbol is loaded with narrative and historical qualities, including its role as an essential structural lifeline to the western United States in the early-to-mid 20th century while simultane­ously being a structural path to death in Europe during the holocaust. This filmic sculpture is a sort of fun house diorama of an infinite stretch of railroad tracks, with the bells and whistles exposed. The great technological agent of manifest destiny collapsed into an obvious fiction.